You’re Involved In A bus Accident. What Do You Do Now? On behalf of Admin of JML Law, A Professional Law Corporation posted in Bus Accident on Tuesday, Jul 17 2018. Taking the bus to work or school every day is fairly common. It could be more cost effective or simply more convenient. Bus drivers often have more training than regular drivers and are meant to operate more safely. They have a higher duty of care since they are responsible for all the persons on the bus. Unfortunately, this isn’t always the case. Your bus driver or another driver may have caused an accident. They could’ve caused you or those around your injury. In order to make a claim, you should have sufficient evidence you can use in your case. You should also know what you should do in the moment when the bus accident happens. An expert witness testimony could provide important evidence if you are injured. This could be a brain specialist showing how the bus driver’s negligence caused your brain injury. This is essential if you’re suing for damages such as medical expenses. An eyewitness testimony can definitely help your case immensely. They are a vital piece of evidence and they can provide vital information. For example, another passenger on the bus could testify giving their side of the story for the accident, giving you more credibility. Taking a picture and/or videos can provide crucial evidence for your case. You should take pictures of the accident scene and injuries you may have sustained. The first thing you should do when getting involved in an accident is to seek medical attention. Even if you feel you aren’t seriously injured, it’s still a good thing to do. This will help keep a record as well as help you with injuries you may not visibly see or symptoms that haven’t shown up yet. An example of this would be a brain injury. You should be sure to call the police so that they can write a police report. This is another crucial piece of evidence you need to have. Make sure you get the perspective on those who witnessed the accident. Their testimony can definitely help your case. They may have seen the other driver texting and driving. Make sure to get the names, phone numbers, and addresses of the other passengers on board as well as from other vehicles that were involved or others who saw the accident. It’s unfortunate that many people get into accidents daily. When you get into an accident on the bus it can be scary. It is more common than you would think. Since a bus is a larger vehicle there may be more damage. More people could get hurt. You had no control over the situation. You need someone to help lift the burden off of your shoulders. If you’re injured, you need to be focused on healing. 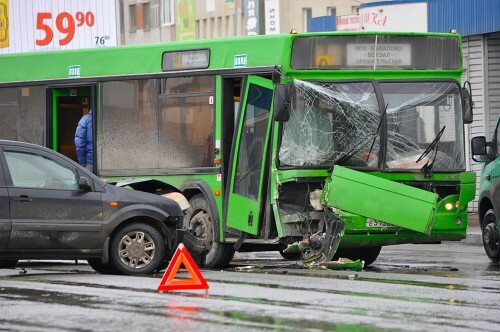 You need someone who is an expert in dealing with bus accidents. You need someone who is attentive to your specific needs. You need someone with years of experience. Los Angeles bus accident attorney from JML Law, A Professional Law Corporation, has protected people like you for over 40 years. Call them today for a free consultation at 818-610-8800 or simply use this contact form.